Our understanding of cosmology has expanded greatly in recent years. 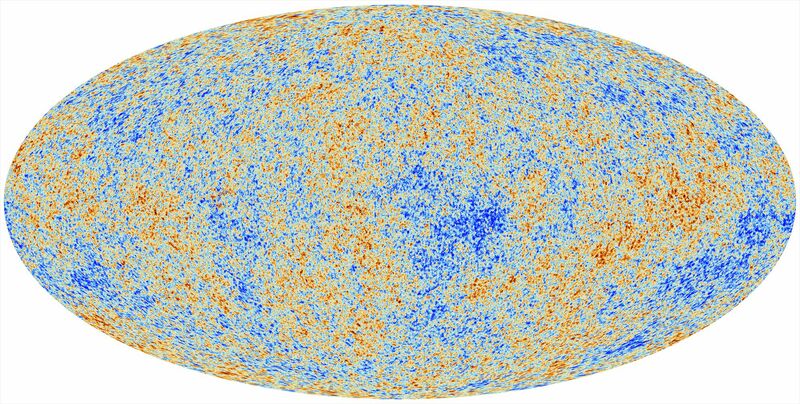 On the one hand, detailed observations of the cosmic microwave background (CMB) have shown us a ‘baby picture’ of the universe as it was only 300,000 years after the Big Bang. During the next roughly half billion years, structures on all scales began to collapse under gravity and the first galaxies formed. How will the SKA peer in to this largely unknown era? 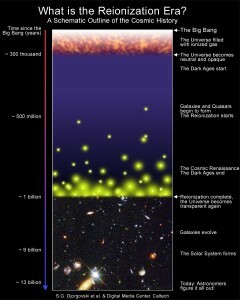 Space and ground-based telescopes have given us unprecedented views of distant Universe. Optical and infrared telescopes have imaged galaxies at distances over 13 billion light years from Earth, at a time when the Universe was less than a billion years old. The promise of large infrared telescopes in space and giant optical telescopes on the ground should reveal even more distant and sensitive views of early galaxies. Space telescopes like Planck that observe the CMB radiation have mapped the light from the very early Universe, just after the moment of the Big Bang. One of the last frontiers in cosmology is to explore this cosmological dawn when the first galaxies formed, and the SKA is the most sensitive radio telescope that will conduct such studies. This period in the early Universe that will be studied started around 380,000 years after the Big Bang, when the Universe was mostly dark until the first galaxies began to shine. It is an age in which these proto-galaxies and quasars formed and has been one of the most difficult epoch’s of the Universe to explore, as these objects are exceptionally faint and much of their light is absorbed by intervening matter as it travels toward us. The sensitive optical and infrared sky surveys have shown that these young galaxies are unlike anything we observe in the local Universe, with stars that could be orders of magnitude larger than our own Sun, and with much shorter lifetimes. The SKA, through imaging of the atomic Hydrogen gas, will provide pictures of the period during and after the formation of the earliest sources of light in our Universe, providing the first detailed measurements ever of the conditions under which they formed occurring in this mysterious time. What is the epoch of reionisation? Prior to the first structures such as galaxies and stars forming in the Universe most of the gas, which was predominantly Hydrogen in the early universe, was fairly evenly distributed and electrically neutral. This is known as the Dark Ages. A special property of neutral hydrogen is that it produces weak radiation at a wavelength of 21cm, which in theory can be used to study this period, but in practice, its signal is very faint, and difficult to detect through the Earth’s ionosphere. However, once the first celestial objects, proto-galaxies and stars, started to form through gravitational instabilities, their light ionised pockets of the gas around them, switching off the 21cm emission from these regions. Astronomers have labelled this important event as “reionisation”. This era in the formation of the Universe has proven difficult to study. Not only are proto-galaxies extremely distant and faint, the key problem is that much of their light in optical and even out to the infra-red is absorbed as it travels toward us. Tantalising clues from the Wilkinson Microwave Anisotropy Probe (WMAP) and the Sloan Digital Sky Survey (SDSS) telescopes have scientists excited, as these objects display characteristics which are unlike anything they have seen before. The SKA will provide detailed pictures of structure formation and reionisation through observations of the redshifted 21cm line of neutral hydrogen. Unlike constraints from the CMB, line radiation allows us to separate the contributions from different redshifts. For example, the first proto-galaxies may form through different mechanisms than our own Milky Way, and the stars inside these objects may be hundreds of times more massive than our own sun. The quest to observe the first luminous objects in the universe has long been an important driver of astronomy in general and cosmology in particular. Interest in these objects has only grown recently with new observations by the WMAP and high-redshift quasars selected from the SDSS. First identified as being high redshift (z) objects, they emit strongly in the radio end of the spectrum. While the nature of these objects was controversial until as recently as the early 1980s, there is now a consensus in the science community that they are compact regions nearby black holes in the central areas of massive galaxies. As they occur at such vast distances, they are part of the jigsaw aiming to piece together the formation of the early Universe from its Hydrogen rich beginnings, through to the time period when then first stars and galaxies started to form. The fraction of ionised hydrogen left over from the Big Bang provides evidence for the time of formation of the first stars and quasar black holes in the early Universe. Think of the neutral fraction as the percentage of neutral Hydrogen present when things star to form in the early universe. The protogalaxies will also ionise surrounding pockets of gas, shutting off 21cm emission around bright objects. The pattern of ionised and neutral gas, and its evolution with time, will teach us about the sources responsible for reionisation. So what will the SKA provide? The Square Kilometre Array will study the detailed properties of the first luminous objects in the universe, and be able to take snapshots of the 21cm emission at many different epochs, before, during and after reionisation, yielding detailed information about the formation of the first structures in the universe. It will provide the best measurements available of the characteristics of the first light sources in the universe. In the early part of the 20th century, Slipher, Hubble and others made the first measurements of the redshifts and blueshifts of galaxies beyond our own Galaxy. The largest observed redshift, corresponding to the greatest distance and furthest back in time, is that of the cosmic microwave background. 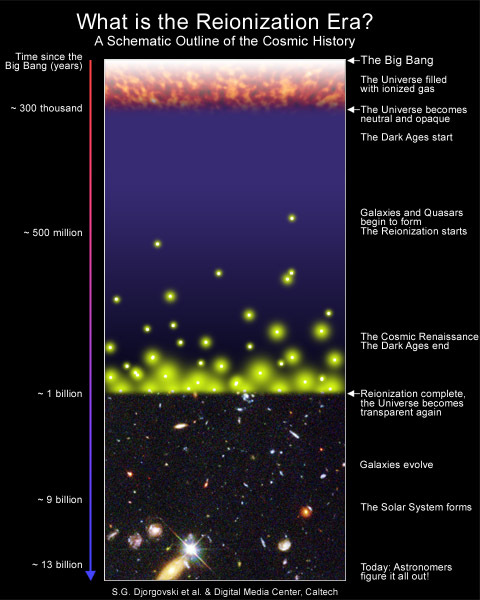 The numerical value of its redshift is about z = 1089 (z = 0 corresponds to present time), and it shows the state of the Universe about 13.8 billion years ago, about 379,000 years after the Big Bang.